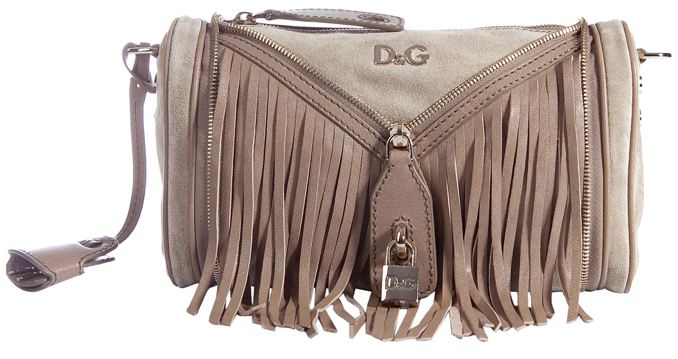 Fringes are in and these D&G Vilma fringed bags are absolutely gorgeous. I love the V Shaped zip at the front with the tiny lock. Have you ever noticed how bags with locks tend to become very ‘in’? Think Chloe Paddington. Of course this lock is much smaller, but nonetheless prominent as it’s one of the main features of the bag. I also love the color. The sandy beige is this season’s color as seen on the Spring 2010 catwalks. The muted subtle tones are the perfect match to the beiges and pastels that are going to be all over your wardrobe this Spring. The zip features are fun and refreshing. The Vilma D&G bag was featured in this month’s Glamour Magazine as part of the section on fringed bags. The medium sized D&G Vilma fringed bag is more expensive than the smaller version, and is dual toned rather than just one color. I think the smaller version would be ideal for a night out, and the larger version, is the better option if you’re looking for a day bag. The D&G Vilma is this years IT bag and lots of celebs are carrying it, including the Queen of fashion, Lady Gaga.